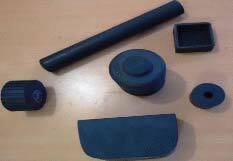 We are a trustworthy Manufacturer, Exporter and Supplier of Customized Rubber Components in Tamil Nadu, India. We are supported by a team of skilled and experienced personnel who makes use of sophisticated machines and latest techniques for their production so that the quality stays intact for a longer frame of time. Offered by us in a gamut of specifications, our Customized Rubber Components are competitively priced.